Imagine a bank where you are the top priority; a concierge greets you and dedicated staff assist you only when you want it. You're in an ecosystem that is designed around advice and learning, not just transacting—where services respond to what's in your mind rather than what's in your account. 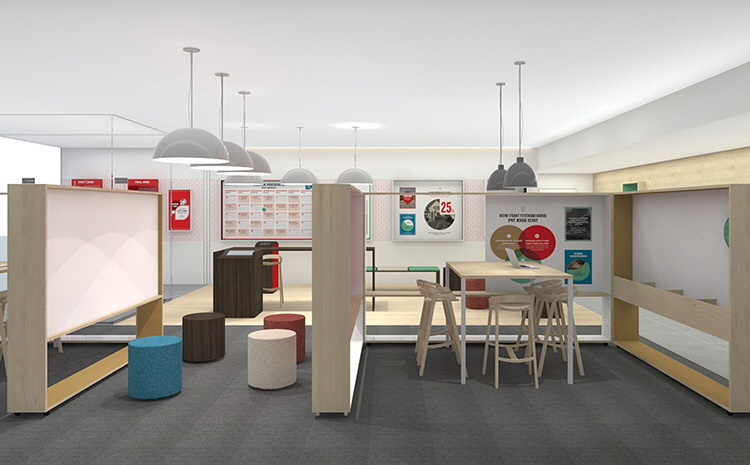 This became part of the design solution when Scotiabank asked IDEO to improve the branch experience for customers in Canada, Latin America and the Caribbean. The fact the markets were at different stages of development presented different design challenges. But what united both outcomes was a branch experience holistically designed from the ground up to serve customer mindset and need. 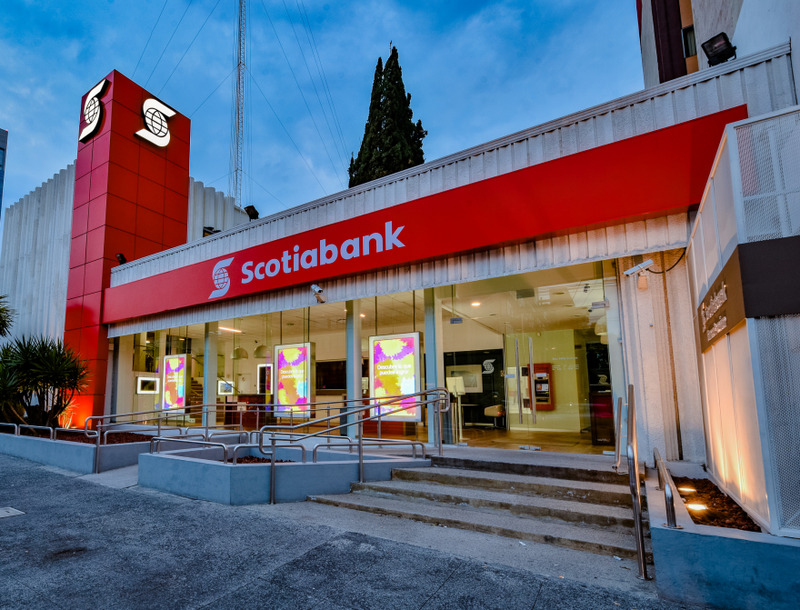 Scotiabank's business in Latin America was growing, thanks in part to a series of acquisitions made in Mexico, Peru, Colombia, and Chile over a period of fifteen years. However, while effort had been put into right-sizing the network, further effort was needed to provide the right customer experience within the bank branches themselves. Furthermore, while customers in these markets could choose from a range of banking options, from global to local to government-run, many believed all banks were the same and questioned whether they were the best place to keep their money. Our challenge was to build trust in the banking experience when trust in financial institutions is in short supply; to cultivate a service approach that seeks to make customers successful through advice and learning; and to leverage digital technology to interact with customers in new ways and encourage the adoption of online and mobile banking, in support of Scotiabank's ongoing digital transformation. Similarly, in Canada, we designed for evolving service expectations and new technology in the creation of new branch models that could meet customer needs in more specific ways—all while bringing a more productive footprint to the market. Framed around 'advice" and 'express' modes, the redesign looked at ways to enrich the branch experience for customers wanting fast transactions, and those wanting deeper financial conversations face to face. Our research was grounded in understanding why people visit a branch today, and what a future branch might look like as more people are choosing to bank online. In both regions, IDEO and Scotiabank brought to market a compelling example of how to ground service in customer need rather than competitive drive. We activated a system of space, service, content, and digital components that created a fresh experience for customers—elevating expectations by providing high-touch service and empowering financial education in the right moments. To inform the outcome in Latin America, we spent several weeks traveling across the target countries, talking with existing and former customers, non-customers, bank staff at all levels, and cultural experts. We also spoke with extreme users—people who refused to use banks and kept their money in a suitcase under the bed, and those who held multiple accounts at different banks. We observed a landscape of institutional distrust and a general banking experience that often did not serve customers' true needs. We heard from customers who received credit from banks yet did not have a basic understanding of how credit works; subsequently, they suffered the financial consequences of poor payment history but did not know why. Years of such experiences made customers more willing to seek financial advice from friends and family than their banks. Our research highlighted an opportunity for Scotiabank to improve financial literacy in their customers through education and approachable service. 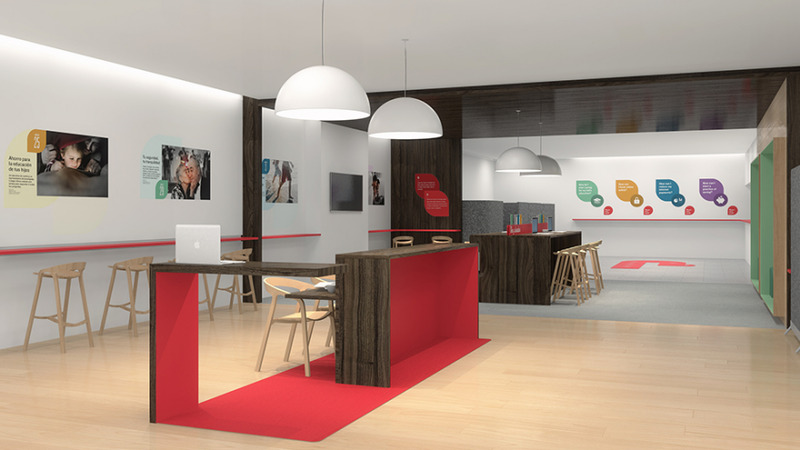 Aesthetically, our challenge was to break Scotiabank out of a sea of sameness. "The general rule was your bank was a red bank or a blue bank, so it was about standing out in both the format and the aesthetic, and bringing a broad consistency across the network," observed IDEO Portfolio Director Hailey Brewer, who guided the work in both markets. To address these challenges, we identified three core objectives to develop across space, content, service, and technology. 1. Foster a learning environment for customers to build trust. 2. Support and enable a distinctive culture of service. 3. Deepen relationships by starting conversations around needs rather than products. Our intention was to break the bureaucratic waiting-and-processing paradigm of the competition, and turn the branch into a place to discover, plan, and achieve one's future. 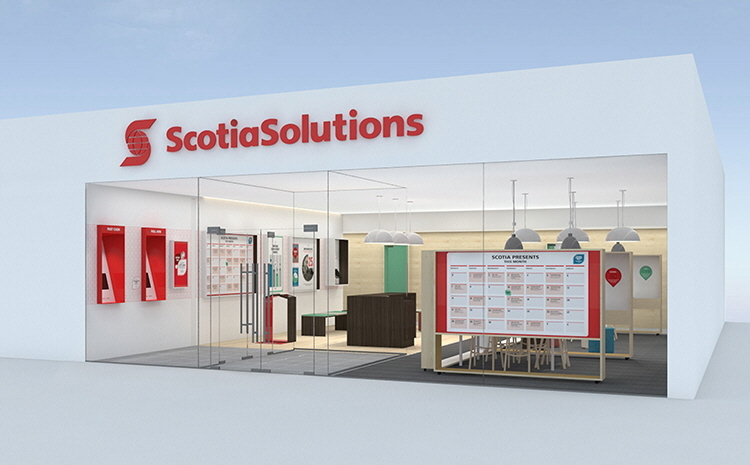 We wanted customers to feel more enlightened and better connected with every visit, and to help Scotiabank invest in customer needs over a lifetime. The idea of prototyping quickly and scrappily in market was an invigorating new approach for the client. In Mexico City, we integrated new design elements into a live branch environment, took customers through the space for real-time feedback, and quickly refined ideas for both space and services. The process was fundamental in guiding insights and determining what elements made it into the final branch design. Overall, the human-centered design process—and prototyping in particular—gave the bank confidence that their investment in the redesign was grounded in customer need, and demonstrated a path for getting to market faster where incremental adjustments can be made after launch. Our first step was to introduce a concierge service and welcome porch to the front of the branch. In Latin America, customers prefer traditional personal service over interaction with digital channels. The concierge was integral to facilitating the usage of self-service technologies, such as ATMs, online, and mobile banking. Second, we permeated the customer journey with touch points designed to build customer trust in the branch's staff. Signs and posters feature staff members' insider tips for how to use the branch most successfully, suggestions for saving time and money when banking, and stories of how they helped customers reach positive financial outcomes—all written in the voice of a person giving advice to friend. 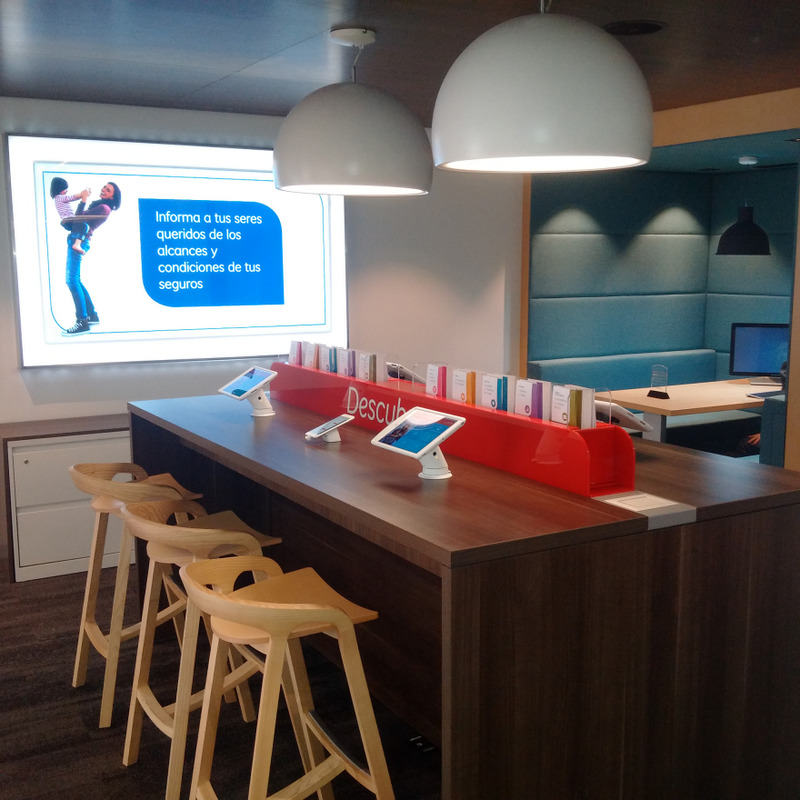 We added brightly colored booth-style workstations where staff can meet with customers in a less formal environment, seeding a future vision where bank staff are fully mobile throughout the branch, interacting with customers while supported by tablet-style devices. At the same time, private alcoves allow customers and staff privacy for deeper financial conversations. We also designed more side-by-side experiences, where customers share screens, tools and information with advisors, to increase transparency with clientele. As a further expression of the branch's commitment to excellent customer service over business as usual, we removed all product-marketing communications from the walls and main spaces of the branch, a major departure from the sales-heavy imagery common in most banks in the region. With each concept, our intent was to convey a space meant for socializing and learning, not just transacting. We amplified this by designing in-branch events where customers can attend presentations and financial literacy classes, hosted around kitchen-style tables in a communal area. The space also doubles as a venue for light touch conversations about a variety of financial wellness topics. Interestingly, designing around customer needs translated to a more fulfilling experience for branch staff. Many told us they felt greater satisfaction working in the new environment in their new roles. Their style of service became more fluid, ultimately helping Scotiabank rethink staff roles more broadly. Based on the progress in Latin America, Scotiabank asked IDEO to apply the same human-centered approach in the Canadian market. Here the client wanted to test the assumption that all branches must provide the same package of services. The hypothesis being that "express" and "advice" could become differentiated offerings for Canadian customers. Interviews with customers revealed that express and advice are not just different services, but expressions of different mindsets. For customers, satisfying service is not about age, income level, or comfort with technology. It's about the specific task a customer has in mind. Sometimes going to a teller is the best solution, sometimes it's not. We spotted an opportunity for a suite of services designed for different customer modes—whether it's zipping through self-service or wanting deeper financial planning advice—creating a branch experience where people can choose the right service for the right moment. 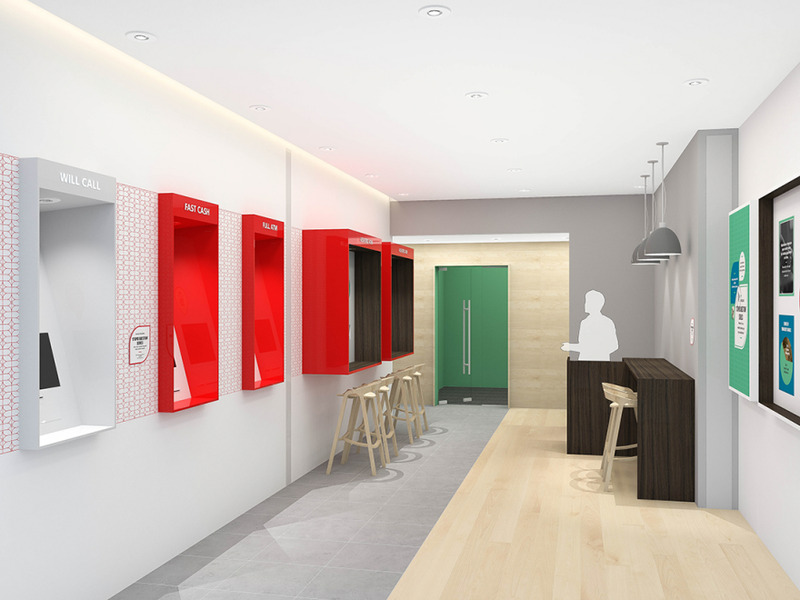 As a result, we delivered on Scotiabank's brief to explore two new types of branches—Express and Solutions—with the twist that each type is intended for same customer in different modes. For Express, the aim is to make everyday transactions fast and efficient. We implemented a triage desk, where a Universal Banker calmly assesses your urgency and directs you accordingly, and coaches who can share accountability and instill confidence as you direct your own transactions. Assistance is there in any moment you need it, and out of your way if you don't. The Solutions model, meanwhile, is about delivering education and guidance. Touch points include an in-branch events calendar and financial experts on hand to craft solutions unique to your life circumstances. Overall, the Canadian branch reboot set the stage for optimizing a new service model based on what a customer has in mind rather than how much they have in the bank. In Mexico City, where Scotiabank launched the first four pilot branches of the new design, sales have increased significantly above country branch average; teller transactions have on average decreased at a greater rate than in other locations, as customers adopt self-service channels faster; and net promoter scores are on average higher than the national branch average. The concierge service has been especially successful and staff feedback on the new environment has been positive. Perhaps most transformational has been positioning the bank as a place to improve basic financial literacy and feel supported by your financial institution. Since the initial pilot launches, Scotiabank has invested in extending the new branch experience, with additional pilots in Peru, Chile, Barbados, Panama, Costa Rica, and the Dominican Republic launching in the next five months. 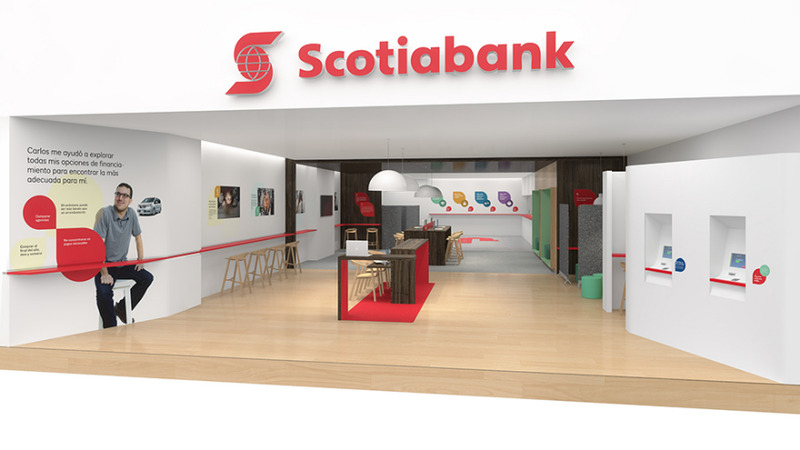 The Scotiabank team is now monitoring customer feedback in-store and traditional business metrics with a view to refining the final design in preparation for future rollout plans. In Canada's four concept branches, employees have gotten a genuine lift from working in the new environment. Those in advisory roles say the new formats have freed them up to have more meaningful conversations with customers and bring more meaning to their work. Customers using the Express format report it is exceeding their expectations. Feedback suggests the new formats are giving customers new reasons to visit the branch. New layers of customer engagement are feeding fresh insights into how these branch experiences will continue to adapt and serve their communities. 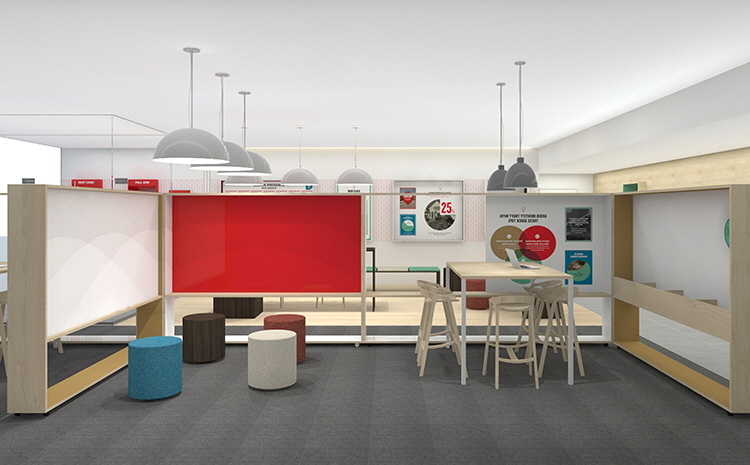 In both markets, the new branches have changed how Scotiabank evaluates their employees, shifting focus from sales goals to customer satisfaction over time. The bank has reinforced this shift by piloting educational programs to learn more about its role as a financial educator. 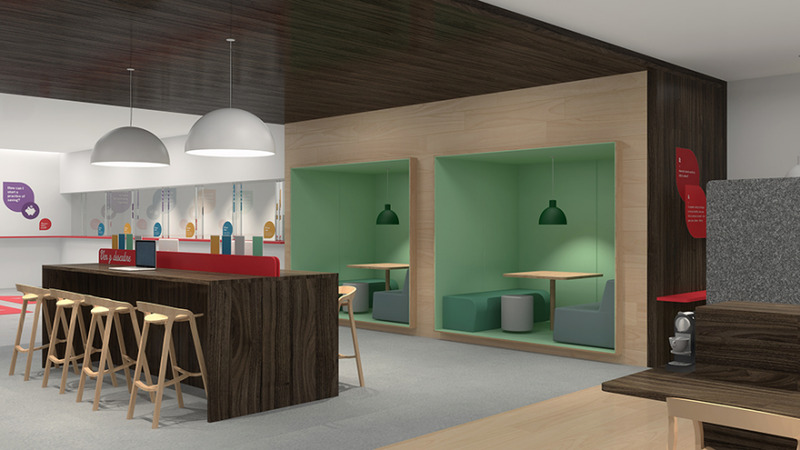 Together, IDEO and Scotiabank worked to create a holistically designed ecosystem of service experience and physical space that amplifies Scotiabank's long-term commitment to providing excellent service. The success of these pilot branches provides Scotiabank a new pathway for providing a lifetime of value to their customers around the globe.